Rapid population growth can be a contributing factor to climate change vulnerability and should be considered in climate adaptation and peacebuilding efforts, said the Wilson Center’s Roger-Mark De Souza at a workshop on climate change adaptation and peacebuilding hosted by the Institute for Security Studies (ISS) in Addis Ababa. Improving access to family planning and reproductive health services “help[s] women and girls overcome the constraints of gender roles and family responsibilities that leave women less agency, time, and freedom to alleviate their economic burdens, achieve education, and participate in community-based adaptation strategies,” he said. The Addis workshop, held in October 2013, brought together a community of practice of more than two dozen experts from Africa and North America to develop conflict-sensitive guidelines for climate adaptation in Africa as a follow-up to an October 2013 workshop. Organized by the Adaptation Partnership and co-hosted by ISS, the Wilson Center, Engility, and ICF International, the initial workshop focused more heavily on climate and conflict, while this follow-up gave participants an opportunity to identify specific entry points for incorporating conflict-sensitivity into climate adaptation efforts. An emerging climate strategy, the integration of climate adaptation and peacebuilding efforts models the success of other integrated development approaches, like population, health, and environment (PHE) programming. Integrated development recognizes that many issues intersect in ways that can create co-benefits if they are addressed simultaneously or heighten risk if projects fail to consider cascading impacts. While there has been more willingness in the development community to consider vulnerability across sectors and program accordingly, population dynamics are often overlooked as an entry point to resilience or a contributing factor to vulnerability. As noted by De Souza, the adaptive capacity of a community benefits when women are engaged. Ensuring access to voluntary family planning and reproductive health services is a way to enable their engagement by easing restrictive gender roles, and, as PHE programs have demonstrated, increasing their role in environmental stewardship. Ignoring population dynamics not only overlooks the key role that women’s empowerment can play in community resilience, it can also heighten vulnerability in important ways. An example of this is how demography, specifically age structure, plays into civil conflict. An analysis by Population Action International found that 80 percent of civil conflicts between 1970 and 2007 occurred in countries where at least 60 percent of the population was younger than 30. On its own, a youthful age structure caused by rapid population growth, does not cause conflict, but like climate change, it can interact with existing conditions to contribute to underlying pressures that lead to conflict. Sub-Saharan Africa, home to over 900 million people, is the youngest region of the world and is expected to more than double in population by the end of the century. It is also considered one of the most vulnerable to the impacts of climate change. This one-two punch is already dealing a heavy blow to many governments’ abilities to provide adequate services (education, health, housing, water, electricity, waste disposal, etc.). It’s not only population growth on its own that plays into vulnerability, however; where and how that growth occurs matters too. Through a combination of growth and migration, sub-Saharan Africa’s urban areas are projected to surge from accommodating 298 million people in 2010 to 1.1 billion in 2050. Between governments’ inability to keep up with services, constrained by economies reliant on climate-sensitive activities, and the fact that many of these cities are on the coast, urban populations are especially vulnerable to changing sea levels, floods, and storm surges. So what does this mean for climate adaptation and peacebuilding? At the Addis workshop, De Souza recommended several avenues for integrating population into climate strategies. While largely absent from the National Adaptation Programs of Action, many of which acknowledged population as an important factor related to climate change but none of which reflected it as a priority in implementation, there is still a possibility of integrating population into the next UNFCCC adaptation process: the National Adaptation Plans. The more that can be understood about a population’s size, composition, and spatial distribution, the better equipped the development and policy communities will be to increase resilience to climate change and address the underlying pressures that contribute to violent conflict. 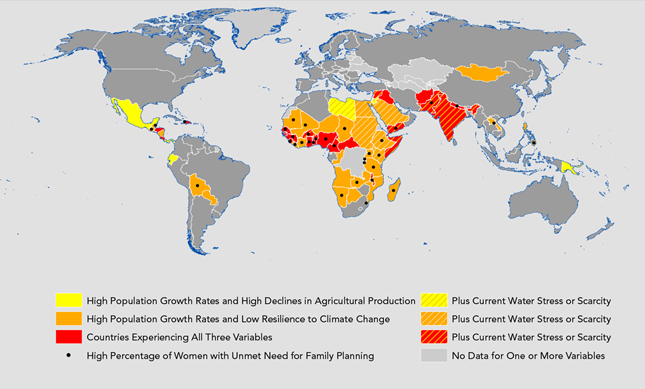 Map Credit: Family planning needs in population and climate change hotspots, courtesy of Population Action International. 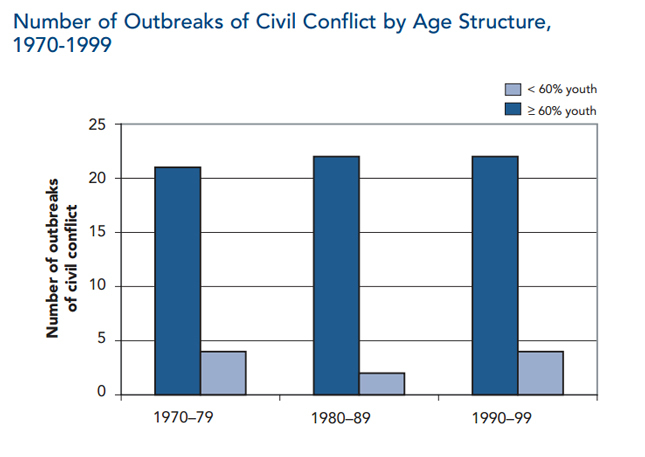 Youth and conflict figure, courtesy of Cincotta and Leahy (2007).